BECOME A TOP PICKER IN BURLINGTON KY! This weekend you might just want to check out Burlington, KY, not only to view the great home deals that are available in the current market, but to enjoy the many different sites and sounds this city has to offer. Take for instance the monthly Burlington Antique Fair. Every 3rd Sunday of the month from April through October, the Boone County Fairgrounds come alive with over 200 antique vendors. 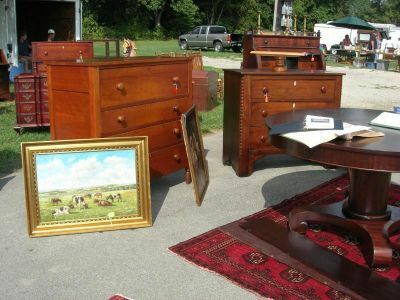 This Sunday, 8.19.12, the antique fair will be active with the hustle an bustle of antique "pickers" of all kinds. In fact, last month, the producers of the TV show hit, "American Pickers", shot a special segment here where amateur pickers competed for the title of “Top Collector”. Why not come on out this Sunday and see what gem you might be able to find! For serious lookers, plan on coming early to be among the first to check out all the deals! a trinket or two for yourself, you might want to head over to the Tousey House Tavern, located just minutes from the Boone County Fairgrounds. This beautiful example of a Federal style home from 1822 is owned by the same family that owns Ft. Mitchell's popular "Greyhound Grill". Here at the Tousey House Tavern in Burlington, you'll find a delicious selection of beautifully prepared traditional Southern food that will leave you wanting to return again and again. After a relaxing lunch, you might want to take some time to explore the many great home deals that are available in the current Burlington market. Have you actually seen what is available lately in this area? There are still lots of deals to be found....you just might be able to purchase a beautiful, Burlington home with a rural loan (called USDA) which is available with no money down! So check out the listings below and see if you can become a "top picker" in this current market !